Inside view of the set. 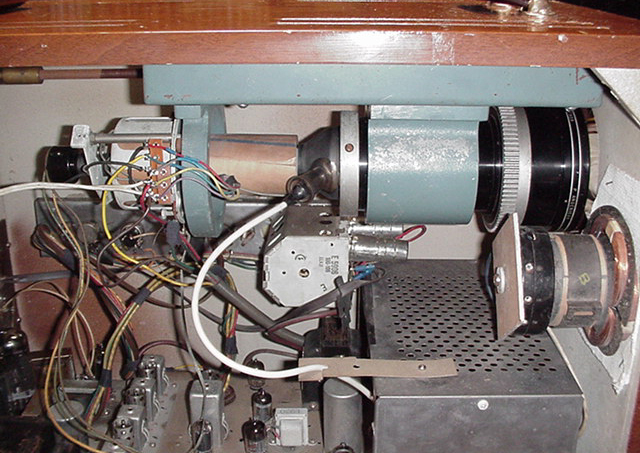 At the top is mounted the CRT with focus coil and deflection yoke and the projection lens assembly. 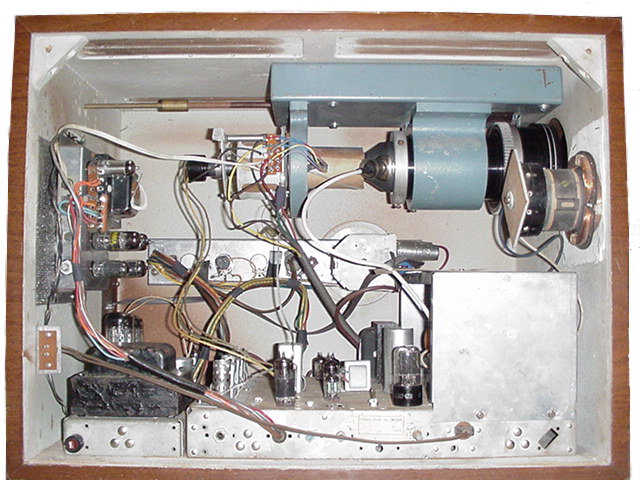 Below the CRT assembly is the main chassis, to the left is the power supply and above that is a chassis to generate the focus voltage. The tuner and user controls are mounted to the side of the cabinet. Close up picture of the CRT assembly. The CRT is a MW6-4, similar to the MW6-2 also known as 3NP4. The major difference between the tubes is that the MW6-4 has a flat face whereas the MW6-2 (3NP4) has a spherical face. 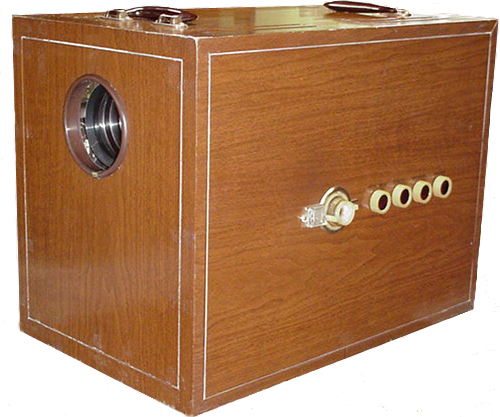 The 3NP4 is used mainly in the Protelgram projection systems, that system uses a spherical mirror in the projection unit and the spherical face of the CRT matches the spherical mirror to generate an undistorted image. The X-102 uses a straight lens system to generate the image and thus needs a flat face to generate an undistorted image through the lens. The set uses separate horizontal output stages to generate the high voltage (25KV) and the sweep signal. The yoke mounted to the cabinet is used in the high voltage output stage.